Panasonic's Lumix FX75 is a powerful 14-Megapixel digicam, featuring a Leica 5x optical zoom lens, Power O.I.S., 720p HD video Recording and a 3.0-inch Touch LCD screen. With excellent performance and good image quality it is definitely worth a look for $299.95. You are looking for stylish and powerful digicam that contains all the bells and whistles while performing in the top of its class. Panasonic's new Lumix DMC-FX75 is a 14-Megapixel compact digicam sporting a Leica F2.2 5x optical zoom lens, 3-inch Touchscreen LCD, AVCHD Lite 720p HD movies, and intelligent auto shooting. With the new Leica DC VARIO SUMMICRON lens and Panasonic's Power O.I.S. (optical image stabilization), the FX75 performs amazingly in low-light situations. It also features a Sonic Speed AF system that allows the autofocus system to focus as fast as a 1/4 of a second. To make this one of the easiest cameras you'll ever use, Panasonic has included an evolving intelligent auto shooting mode to ensure that there is no motion blur or camera shake effects in you images. This mode also takes care of all of your camera settings, including choosing the correct scene mode for your current situation automatically. This guarantees that you will have the best settings for most of the shooting situations that you will find yourself in. Most of the camera's settings are controlled through the Touch LCD screen, including the ability to touch the screen where you want the camera to focus. When you touch the screen, the camera will immediately focus and then capture an image without you having to press the shutter release. The screen itself is very responsive to either your finger of the included stylus, making it a pleasure to use. Made up of 230,000 dots, the 3-inch intelligent touchscreen shows a crisp, sharp image that is easily visible in all lighting conditions, including direct sunlight. Performance from the FX75 is outstanding. The camera is able to capture its first image just 1.8 seconds after being turned on. Its shutter lag is less than 1/10 of a second when the camera is pre-focused and between 3/10 and 5/10 of a second depending on the current shooting conditions. Shooting with the flash on, the camera has a shot-to-shot delay of just under 3 seconds, and a delay of just 1.6 seconds when the flash is off. Burst mode has the ability to capture 3, 14-Megapixel images in just 1.9 seconds before filling the buffer. There is also a high speed burst scene mode that allows the camera to capture 3-Megapixel images at a rate of up to 7.3fps. In this mode, the camera was able to capture 35 images before the buffer filled. All of our tests were completed using a 2GB RiDATA Pro 120x SD memory card, Normal Shooting Mode, 1 Area High Speed AF, Flash off and all other settings at the factory defaults unless noted otherwise. . All times may vary depending on lighting, camera settings, media, etc. Image quality from our outdoor images show us an overall good exposure with a few overexposed highlights in our cannon shots. When viewing the images at 100%, we see a little more noise than we would expect to at ISO 80, but we have seen this with all of the 14-Megapixel digicams that we have tested over the past year or so. Helping you frame and compose your images is the F2.2 Leica DC VARIO SUMMMICRON 5x optical zoom lens. With a wide zoom range of 24mm (35mm equivalent), the FX35 is able to capture vast landscapes, even wider than most wide angle zooms at 26mm to 28mm. It is also great for capturing large groups of people from a close distance. At the 120mm (equivalent) telephoto end, you can get a little closer to your distant subjects or tightly frame individuals for close-up shooting. Our indoor sample images show a good exposure and accurate white balance, producing a realistic replication of our scene. There is a very low noise level for each ISO setting from ISO 80 thru ISO 400. At ISO 800 you will lose a lot of the fine details in the image, but these images can still be used to produce excellent smaller prints. Helping with your low-light images is the built-in flash unit. Although it is small, it has a range of up to approx. 22ft. (W) or 7ft. (T) when the camera is set to ISO Auto. It did a descent job lighting our scene from 5ft. away at ISO 80. As with many of the flashes on compact digicams, the lens gets in the way of the flash at times when shooting in macro mode, as can be seen in our macro shot. Portrait photography is very easy with the FX75, as long as you are shooting in a mode that has the face detection AF activated. This allows the camera to quickly find faces within the frame and set the exposure and white balance to them, helping the camera produce an image with realistic colors and excellent skin tones. Cosmetic mode allows you to adjust the skin tones while shooting. We also saw that the red-eye reduction flash mode worked very well with virtually no redness found in the eyes of our people subjects. Capturing movies with the FX75 is incredibly fast and easy. Thanks to the camera's video record button, the camera is always ready to shoot video, no matter what shooting mode it is set to. With just the push of a button, you can record 720p HD or standard 640x480 movies. With the HD movies, you have the option of recording in either Motion JPEG or AVCHD Lite, with the latter being a high quality compression that takes up less space on your memory card without sacrificing video quality. Our sample video shows the excellent quality captured in AVCHD Lite mode. It plays back smooth and shows an excellent overall exposure and color. Keep in mind that when you shoot in lower light, you will start to see some noise in the video. Another great feature is the availability of the 5x optical zoom while you are recording. The only thing holding back the HD movies is the built-in mono speaker. This very sensitive speaker will pick up all audio around the camera, including background noises that you might not notice at the time while recording. Be careful where you position yourself while recording to help cut down on these noises. Powering the FX75 is a 3.6V, 940mAh rechargeable Li-Ion battery. During the completion of our tests, it was able to capture 362 images and videos on a single charge, with approx. 50 of these images coming from the high speed burst scene mode. This perfectly supports Panasonic's claims of capturing 360 images on a single charge. This is a great battery life which will get you through a day of shooting, but we still recommend keeping a spare battery charged and on hand at all times, just in case. This is easy to do thanks to the included quick charger, which is small enough to store in a small camera bag, purse or suitcase. 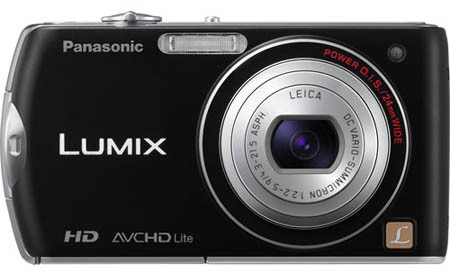 Bottom Line - Panasonic's Lumix FX75 is a stylish and powerful compact digicam. Featuring a 14-Megapixel imaging sensor, 5x optical zoom lens, Power O.I.S., 720p HD video capture with dedicated video recording button and a 3.0-inch Touch LCD screen, you will be hard pressed to find a camera with more fun and useful features. These features are supported by its robust performance and good image quality. With a MSRP of US $299.95, this is an excellent choice for anyone looking for a touchscreen digicam.